As the cooler weather starts to roll in and you get excited about drinking those sugary, pumpkin-flavored drinks and eating all of the high-calorie holiday cookies, working out may be the last thing on your mind. To ensure you maintain that summer body you worked so hard for, it is important that you do not let working out fall on the back burner. We have pulled together some reasons why you need to start (or continue) cycling before the holidays as well as some strategies to help you stay on track before, during and after the holiday season. Reason: You want to maintain, or even improve, your current fitness situation. Strategy: Sign up for an indoor cycling gym membership! If you want to keep your body in shape during the holidays, it is important to stay focused on fitness. 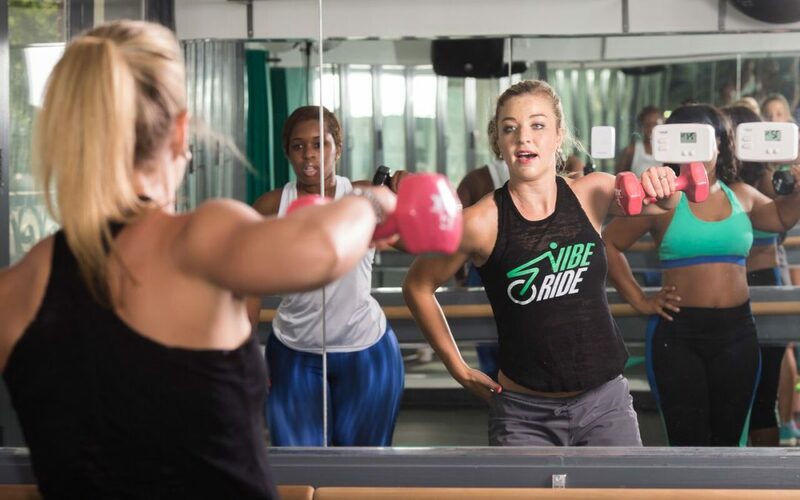 When you commit to a cycling studio or indoor cycling classes, you are far more likely to hold yourself accountable when it comes to achieving your fitness goals. If signing up for a cycling gym membership is not enough, consider enlisting a friend to keep you in check. If you know that your friend will be cheering you along during the hills and sprints of an indoor cycling class, you will feel more confident in your ability to maintain, or boost, your fitness level. You can in fact maintain your level of fitness during the holidays if you commit to a cycling gym prior to the holiday season. Reason: It’s harder to regain muscle after you take time off, or eat too many cookies. Strategy: Add regular weight training sessions to your workout regimen. If you not only indulge in holiday treats, but avoid the weights, you will have a harder time regaining muscle once the holiday season is over. Lifting weights a few times a week can make a huge difference in regards to muscle definition as well as overall calorie burn as muscle burns more calories than fat. Instead of letting the extra calories from holiday food get to you, adding weight training can prevent you from losing the definition you worked so hard for during bikini season. Make sure you take some indoor cycling classes that incorporate weights or try out a weight training class in addition to your more cardio-focused indoor cycling workouts prior to the holidays. Reason: You need as much motivation as possible to avoid all of the holiday treats. Strategy: When you start cycling before temptation is around every corner, you know that you will have the motivation and willpower to say “no” to another piece of holiday pie. Working out increases your happiness, lowers stress levels and can therefore become necessary to feeling good about yourself and your body. Once you have gotten into a regular workout routine, you will realize these benefits and you will be confident in the fact that you prefer going to a cycling class versus pouring another cup of high-fat eggnog. Indoor cycling is a great way to not only prove what a great workout can do for your body, but it can also connect you with a group of like-minded people who will keep you motivated to stay in shape prior to the holiday season. When you start cycling before the holidays, you increase your likelihood of staying on track, or even increasing your level of fitness, during the holiday season. Whether it is picking up the weights during your next cycling class or finally committing to a membership at a cycling studio, getting involved with indoor cycling before the holidays will get and keep your body in shape.